How can GM Hikaru Nakamura reach the next level? Nakamura would never make 2600. Nakamura is only a bullet/blitz player. Nakamura didn’t have proper “chess education”. Nakamura’s arrogance is not commensurate with his accomplishments. Nakamura would never break the top 20. Nakamura would never beat a top-ten player. Nakamura would not win an elite tournament. Nakamura would never break 2700. Nakamura would never break 2750. Nakamura will never break 2800. These (and others) were part of the arguments being made about Nakamura on chess servers, websites and blogs. There has been no other player in recent memory whose skills have been more questioned that Nakamura’s. Those who followed his progress closely (particularly those in the U.S.) knew better than to doubt his ability. Of course, he has destroyed the above arguments and is now at 2782 “live” rating list nipping on the World Champion’s heels. Anybody in the top ten and who’s under 30 can make a push in some way and suddenly be right there. You look at Gelfand is fighting for the title right now… and he’s 40. If you are Nakamura or Caruana, you gotta think, “What do I need to do to take my game to the next level to catch the two favorites who are Magnus and Aronian.” Right? I can’t discount the effect of dramatic improvement. Even Aronian himself has improved dramatically in the last couple of years. Nakamura winning the 2009 U.S. Championship. Photo by Daaim Shabazz. This seems to be the increasing sentiment, but the question remains, “What is it that Nakamura has to do to vie for the championship?” There was an earlier essay on these pages titled, “Is Nakamura the ‘Real Deal’?” which covered some of these issues. Unfortunately, he will not compete in the Candidates tournament in March 2013, but should be able to get into the next on rating qualification. Nakamura has shown that his chess skills are not questioned, but there are areas of improvement that he admits to. The motivation for his famous alliance with Garry Kasparov was to improve his opening repertoire and he still talks about improvement in this area. There is talk about his lack of a world-class team. Most of the top players carry a trainer and/or a team of analysts to provide support. Nakamura works primarily by himself with the assistance of his trusty friend, Kris Littlejohn. It will become increasingly challenging to carry such a sparse support system when he begins to compete in qualifiers, candidate’s tournaments and hopefully the championship. It is the contention of some that Nakamura’s last mile will entail help in non-chess areas. Perhaps he will need to enlist the advice of a sports consultant or an experienced chess player who may be able to give him some valuable insight on psychological preparation and how to navigate the treacherous waters of championship chess. This may include handling of the mass media. In addition, he still needs a sponsor to make a credible push. Nakamura realizes this. With his current U.S. crown, he should also get a publicist who can schedule interviews and appearances, so he can tell his story and perhaps market himself to potential sponsors. He may also need an image coach who may help him craft his brand image to the public. 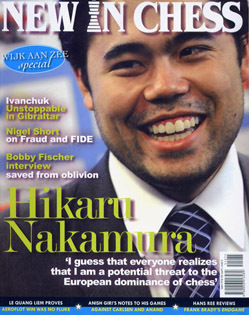 Although Nakamura is a household name in the world of chess, the general public has little knowledge of his sensation. That will have to improve going forward. Regardless of his “bad boy” image, Nakamura is certainly good for chess. A consummate fighter and sometimes provocateur, perhaps he is one of the few up and coming players who can ignite excitement to make sponsors and the general public pay attention. Here is an old blog posting at chess.com. There are apparently those who confuse liking a player with answering whether or not he will be champion. They could have also ignored the question. LOL, good point Daaim i forgot about this stuff. Nakamura teased me on Facebook about this article. He wasn’t critical, but I wasn’t sure of his impressions. The next step? He has already taken this step, not to say the suggestions above is incorrect or that he will not followed that advice. Nakamura has it all. He is not afraid of losing and he will play double edged games. He will show exactly how he feels. Exciting, right? He also has recently developed into being able to play more solid games too. He had to when he found himself playing against the elites of the chess world. His preparation methods are excellent and he has said so without saying how he does it. In Post Games interview, it is amazing what a fan can learn about Grand Masters or reading his tweets! Sure, there is always the negative aspects of all the great chess players in the world and Naka is no exception. For one thing, He does not live in Europe and has said he will not move to Europe. That fact tends to handicap him. Flying back and forth across the pond is not a lot of fun, unless you just happen to sit by a beautiful women! There are other reasons why he might not make it to the very top. Why? Now come on! Just look at he has to beat to make that goal! No names necessary! Well, I am glad to see such a player as this man rise to the top 10. I met him in 2009 in St Louis after winning the US Championship. He did not know me, yet he took the time to chat with me and answered all my questions and no he was not the man the Naka haters say he is. No indeed! Once again, the USA can be proud of this man who holds the title once again! A man who pulls no punches when he is being interviewed. He reminds me in some ways of Joe Namath, you know the guy who predicted the Jets would win the Super Bowl! Someone should give Nakamura a fur coat and he should wear it when he makes it the World Championships! Now that would cause a buzz! Some people do not like direct talk and some people are going be haters till the bitter end, but for some reason if Naka takes the ultimate prize, I believe the haters are going to show some respect for this Grand Master and there is no doubt his fans will go wild if he wins it all! Naka fans are the best! Nakamura is a different type of player… we have not seen one like him in the Internet age. If you look at other top players (besides Carlsen) there is nothing that stands out. Both Carlsen and Nakamura are both visible, active and have other interests outside of chess. I believe in the post-Anand era, chess will enter a new phase. The question for Nakamura and chess in general is how to successfully market this phenomenon. Thanks for the Chess Drum blog. Yes, you are correct about “how to market”…… In a recent post game interview in St Louis, Nakamura was candid about the progress of the younger USA chess players who play at top levels and said the progress expected has not happened and he pointed out why, the lack of money in the game of chess. He also went on to say to become an elite chess player it takes a full time commitment. Robert Hess and Ray Robson and others are attending college and do not spend their time just studying and playing chess. Yes… and we have lost a number of GMs to “traditional” careers such as Michael Wilder and Patrick Wolff. Nothing wrong with this, but the lack of money in chess forces these decisions. 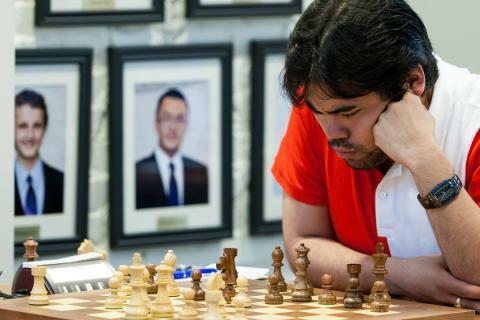 World Mind Sport Games: http://www.thechessdrum.net/blog/2012/12/16/2012-world-mind-sports-games-beijing-china/ Hikaru Nakamura wins three silver medals! Wow thats pretty good Daaim considering the fact that most Americans since fisher, hasnt done as well over there in the traditional chess tournaments. Ive seen a few of the the games hes played with the top guys, looks like he needs more confidence or arrogance to me. Perhaps, arrogance and confidence are interchangeable depending on who ya talk to and what ya know? Opinion? ,Guess?, who Knows? Chess is Funlearning. BUBBA FISHA. The next world champion could be any of these elite players: Carlsen, Naka, Aronian, Fabiano and a few others. I will always be a fan of Naka, whether he’s going through bad time or not. He’s the best we have right now. When and if he captures the world championship, it will undoubtedly help cheer up chess in the US. I remember him doing what I am doing right now with my son; taking weekly drives down to the Marshalls to sharpen his skill. Naka may need to work on mastering the psychological aspect of the game, but not in the game itself. That’s what Carlsen appears to have over him. A incredible sense of poise!